After weeks of holiday-related indulgence, we’re really enjoying Lighten Up Month’s lighter, fresher menus. We’ve even decided to incorporate 1 or 2 meat-free days per week for our 2014 health-related change…we don’t use the word resolution in our house! We’re starting with Meatless Mondays in January and adding one more day in February. We couldn’t be vegetarian 100% of the time, but this seems like a great change to us. I’ll keep you posted on how it goes during the year and maybe even share some of our favorite veg-friendly recipes! One of our favorite Lighten Up meals in Winter is soup…they’re a hearty, warming meal-in-a-bowl. One thing I refuse to compromise on is flavor, which can sometimes happen when you reduce fat and calories in your dishes. I find that using lots of herbs and spices really helps fill the void left by using lower-fat products. 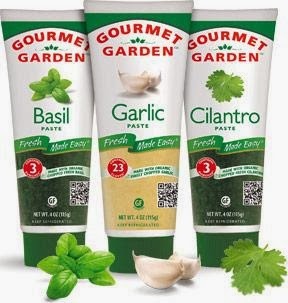 One easy way to use more herbs in your cooking is with Gourmet Garden tubed herbs and garlic. They recently sent me a package containing 11 of their most popular varieties, including garlic, parsley, chili peppers, Italian herbs and basil. As soon as I saw this grouping, an Italian-inspired soup immediately came to mind. 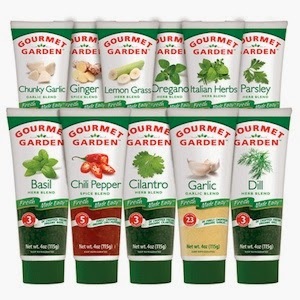 If you’ve never used Gourmet Garden products, you simply must…I am now hooked on them and plan to keep them in my fridge at all times! They use organic herbs...within 24 hours of being picked, they chop them just like you would yourself. Then, they're packaged in handy squeeze tubes that allow you to use just what you need. They even stay fresh in the fridge for up to 3 months! Gourmet Garden herbs and garlic worked perfectly in my Italian Chicken-Orzo Soup. It’s chock full of fiber-rich veggies: onion, celery, zucchini, mushrooms and tomatoes…for protein, I used lean chicken breast. The convenient Gourmet Garden herbs saved me so much chopping time, and they provided the Italian flavor that I wanted for this soup. You can use any pasta you like, but I opted for tri-color orzo. It cooks quickly and is an easy-to-spoon pasta. This was a hearty, healthy dinner that we enjoyed on a cold Texas night. It makes 4-6 servings and tastes even better after an overnight rest in the fridge. Step 1: Heat the olive oil in a large Dutch oven over med-high heat. Add the onion and celery and cook until the onion is translucent. Toss the chopped chicken with a bit of salt & pepper, then add to the pan. Cook until the chicken is no longer pink. Add the Gourmet Garden Ingredients and stir well to combine. Step 2: Add the diced tomatoes – juice and all – to the pot. Add the zucchini and mushrooms, then stir to combine. Bring to a boil, then lower the heat to med-low. Cover and simmer for 30-45 minutes. Step 3: After the initial simmer, add the orzo. Cover and cook for 10-15 minutes longer, until the orzo is tender. To serve, ladle into deep serving bowls. If desired, top each serving with a spoon of grated parmesan. This soup is hearty and filling on its own, but a simple green salad would pair nicely with it. This soup is very comforting and filling…a healthy complete meal in a bowl! We loved the rich broth, the juicy chunks of chicken breast and the healthy veggies. The Gourmet Garden products provided the perfect Italian seasoning to the soup, and they were a snap to use. You can find Gourmet Garden products in the refrigerated section of the Produce department of many large grocery stores, near the bagged salads. So...how would you like to try out Gourmet Garden's wide variety of fresh herbs in your kitchen? Well...you're in luck! The nice folks at Gourmet Garden are going to give one lucky Weekend Gourmet reader an insulated cooler that's filled with ELEVEN of their most popular products: Basil, Chili Pepper, Cilantro, Chunky Garlic, Dill, Garlic, Ginger, Lemon Grass, Oregano, Italian Herbs and Parsley. Just think of the amazing culinary creations you'll be able to make! These herbs are perfect for saving time in the kitchen, and their flavor is fresh and bright. To enter the giveaway, simply follow the instructions below. I'll accept entries until 1159 p.m. CST this Friday, and I'll notify the winner this weekend. Good luck! Disclosure: Gourmet Garden provided me with a selection of their herbs to facilitate the feature. I received no further compensation, and all opinions expressed are my own.